With half of the chips in play during six-handed action, it looked like Alex Yen wouldn't be denied in his bid to win the Mid-States Poker Tour Tropicana Evansville Main Event one year after finishing second here for $35,668. 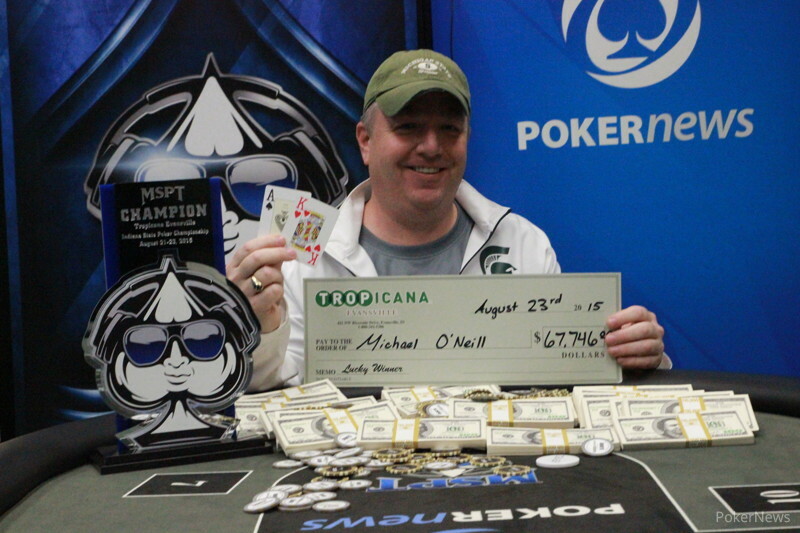 Mike O'Neill spoiled the revenge story, though, storming to the lead and winning the tournament for $67,746 and relegating Yen to another runner-up finish worth $39,925. The MSPT's second trip to Southern Indiana drew 251 runners, just enough to inch past the guaranteed prize pool of $250,000. Forty-nine of those players qualified for Day 2 after two starting flights, and two-time World Series of Poker Circuit gold ring winner Josh Turner was the most notable player to bust out before the money was reached at 27. The final results of the tournament began to take shape during Level 19 (4,000/8,000/1,000). That's when O'Neill and Yen surged to monster stacks, and one of the most dangerous players remaining, two-time MSPT champion and MSPT Team Pro Jason Zarlenga, went bust in 20th when he got the in on a board against Craig Spalding's . Spalding nailed an ace on the river, and that was that. When Neil Patel busted 11th to Jim Russler's slow-played kings, the final table was set with Jim Will entering as the chip leader at 1.1 million. Yen was in second at 820,000. Things started off slow after the break with only short stacks Matt Lushin and David Dang busting in the first level, but Yen made his move in a clash with Will during Level 23 (10,000/20,000/3,000). In a limped pot, Will bet 60,000 last to act after three checks on the flop. Yen made it 150,000 from the big blind, and Will called. Yen bet 225,000 on the turn, and Will shoved for Yen's 860,000. The latter called with the for a turned straight, and Will needed to fill up with the . He failed to do so, and Yen took a monster lead with more than 2.1 million. Just minutes later, O'Neill got it in with the on a board against MSPT Team Pro Nick Pupillo, who flopped a set of sixes. Like Yen, Pupillo was making a repeat final table appearance, but he was dealt a crippling blow when O'Neill binked his flush on the river. Pupillo busted in sixth shortly thereafter, following Will (eighth) and Spalding (seventh) out the door. Jim Russler was right behind in fifth, followed by Scot Brady, who grinded a short stack long enough to ladder to fourth. Three-handed play between Yen, O'Neill, and Allen "Chainsaw" Kessler proved to be a grind, lasting more than an hour. "Chainsaw" lost a big pot with kings when O'Neill out-flopped him with the , and Kessler shipped his last 10 big blinds or so with the only to run into O'Neill's kings. Heads-up play took on a decidedly more aggressive tone, as Yen and O'Neill traded the chip lead a few times. In the end, though, O'Neill simply appeared to make too many big hands, showing down trips and a straight in huge pots. Finally, both flopped top pair on the flop, but it was O'Neill who had a hammerlock with the against the . When Yen didn't improve, he had to settle for another second-place. Mike O'Neill raised to 125,000, and Alex Yen called. The flop came , and Yen checked. O'Neill bet 125,000 again. Yen announced a raise and put 400,000 in. O'Neill said he was all in, and Yen flicked a single chip in to signify a call. Yen had just three outs, and the and both missed him, ending the tournament. "Second again," he said softly after knuckling the table. Mike O'Neill and Alex Yen each put in 75,000 on a flop, and both checked the . O'Neill bet 150,000 on the , and Yen called after approximately a minute of thought. O'Neill showed and took the pot with trips. Mike O'Neill bet 300,000 on a board, and Alex Yen called. O'Neill slid 850,000 in on the river, and Yen snap-mucked. "I hit my gutshot," O'Neill said, tabling the . Alex Yen opened for 125,000 and called all in when Mike O'Neill shoved. Yen had exactly 1 million, and he doubled up as the board ran . Mike O'Neill moved all in for 1.295 million on a board of . Alex Yen cut out the requisite chips and called after about a minute. O'Neill looked a bit disappointed and showed but Yen told him he was good and tabled . The river bricked with the . Alex Yen put Mike O'Neill all in for 950,000 after O'Neill opened to 125,000 on the button. O'Neill called off. Both hit the flop but it was O'Neill still leading after fell. The turn opened up some more outs for Yen, but the missed him. Alex Yen (left) and Mike O'Neill play heads up.